The Stories and photos that I receive from people who wear and enjoy my work are what makes my days! Here are a few of the ones that I have recieved over the years. 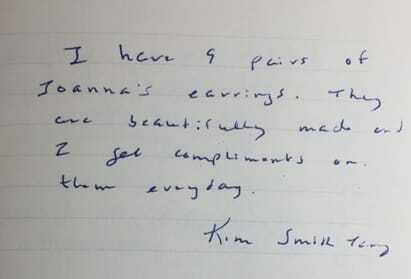 Here's a note from another collector who enjoys this ring too! "When I asked my boys then 8 and 9, for ideas of what I should put in my Earth locket they right away decided to write their names on tiny little bits of paper and then they asked it they could tuck their names into the locket slot. I love having their names so close to my heart as a constant reminder for me to stay healthy and strong for them as they grow." taking care of others yet I have made recent changes and I have also been busy taking care of myself (yoga, meditation, diet, sleep) which I believe is a prerequisite to being able to flourish into fully knowing and being myself. clacking sound I just love as it is a reminder to be present in whatever it is that I am doing. Thank you so much for the beauty you have created with this locket and the pleasure and delight it brings to where I am in my life right now as I come to the end of this 61st year." I chose the perfect locket for me at this time. I have come across more references that deal with "Know Thyself, Be Thyself". It's all very cool." My friend and fellow artist came to me overwhelmed by the recent loss of her brother.She needed to find some way to honor his life. We decided on the treasured locket and to make a special space inside it to hold some of his ashes - the ashes were then sealed with a plate that has his initials and 48 tiny raised dots that when she flips open her locket she can see and touch. 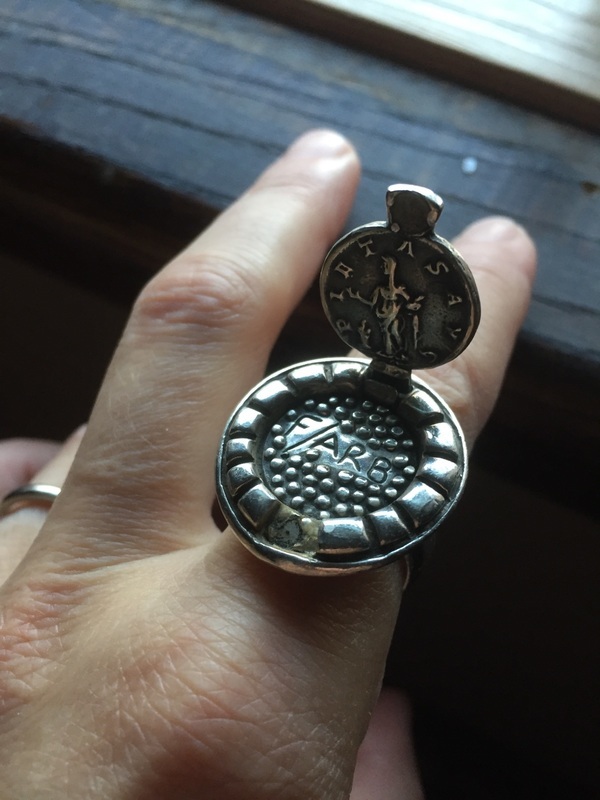 We made it as a ring so she is constantly aware of it’s presence with her and she tells me the locket helps her treasure the number of years he lived in a healing and lasting way. 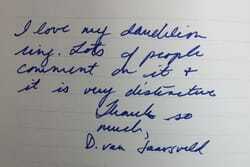 "Thank you. Your work expresses both my brother and I in one piece. Another customer was looking for a way to honour and keep with her the memory of her mother. She decided on the Treasured Locket and to make it more just for them we recorded the birthday of her mother on the back of the locket and the words always and forever inside. The locket helps as a reminder of how her mother's life goes on through her family and all the people that her mother knew through her life. And tell you just how much joy the locket you created for me has brought. 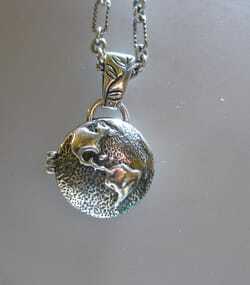 Every part of it reminds me of my beautiful mother, and when I wear it, I feel close to her. Probably the style that I get the most stories about is what I call the Splash series - but as you can see from the notes below once a piece leaves my studio it becomes totally whatever the new owner wants it to be! Part of their own individual signature style - name and all! 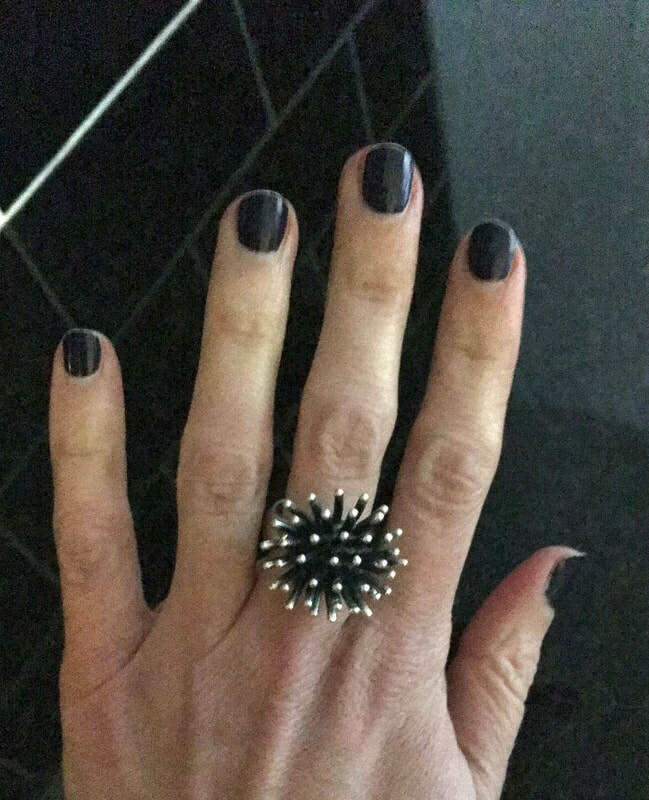 To the left is a photo a customer took of her own hand after she recieved her Big Splash RIng in the mail - this customer had been thinking about and wanting this ring for a long time - sometimes the waiting makes the finally decision to go for it even that much more special! "It arrived and I love it!" 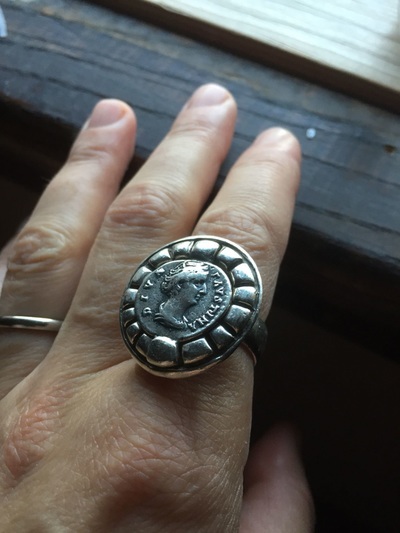 Yet another note about this RIng came from another customer who has been wearing the Big Splash RIng for well over 10 years and she had decided it was time for another. I love hearing how people build their own very unique collections. Picking up pieces on their travels throughout Canada and the US. 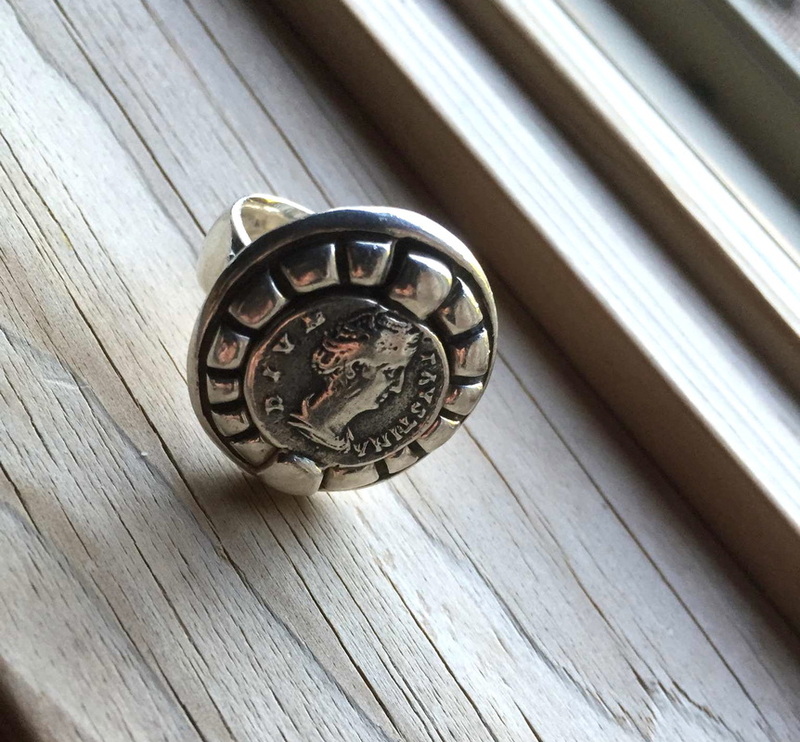 These rings were made for a couple who has travelled from afar to find each other in Canada! Their choice of the journey ring him and the muse with a 1/2 karat Canadian Diamond, and band with tiny diamonds for her seemed perfect for them. ​ It was so nice to see them so happy with the result! 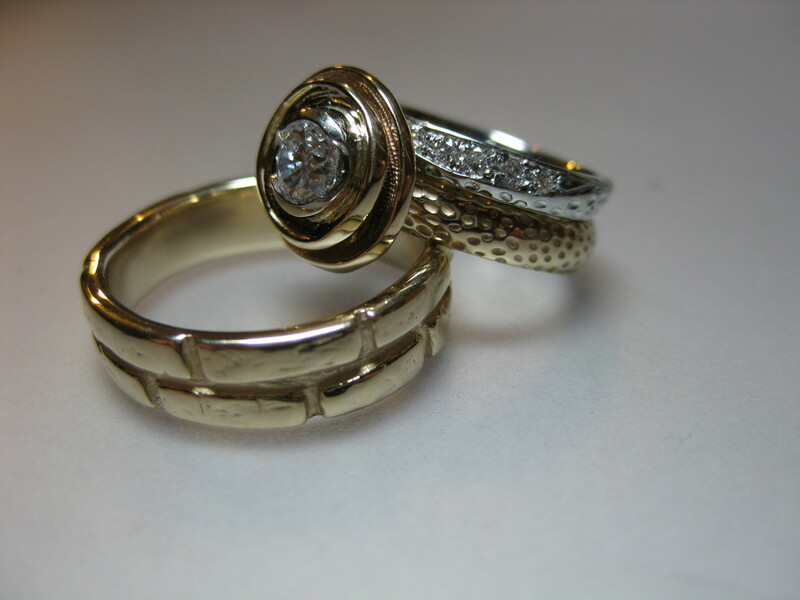 Another couple looking to repurpose their worn out rings liked the style of the Muse ring too! 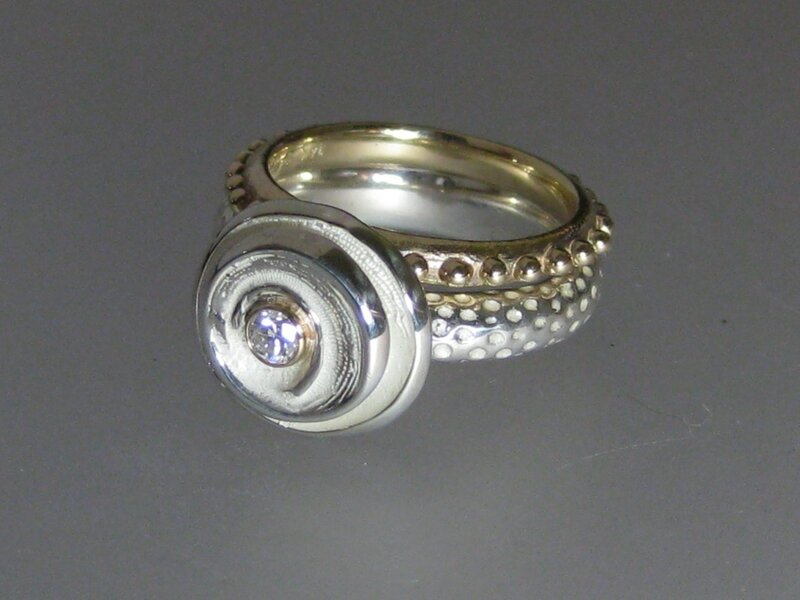 To the left you can see the result - the muse ring is in Sterling silver and the repurposed small diamond set is in 14k gold. The gold from the old bands became the side twiggy. They were very happy too!